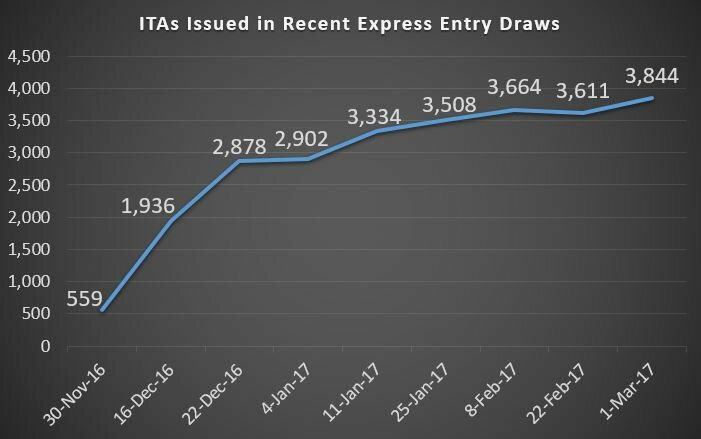 On March 1, 2017, 3,884 Invitations to Apply (ITA) were issued to candidates in the pool for the Express Entry immigration selection system with a Comprehensive Ranking System (CRS) point score of 434 or above. 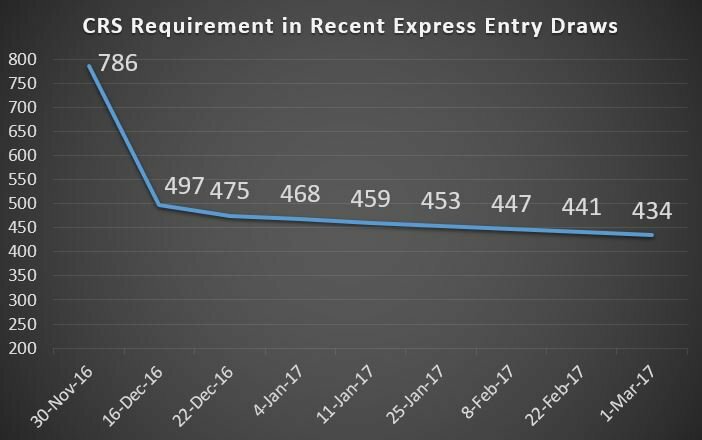 For the third time in a row, the number of CRS points a candidate requires to receive an ITA has dropped to a level never before seen since the introduction of the Express Entry immigration selection system in January, 2015. Coming just seven days after the last draw, this draw also represents the highest number of ITAs ever issued in a single draw, and brings 2017’s total number of ITAs issued to over 20,000. 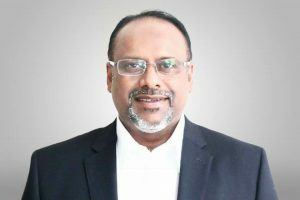 Candidates who receive an ITA are now in a position to submit an application for Canadian permanent residence to Immigration, Refugees and Citizenship Canada (IRCC). 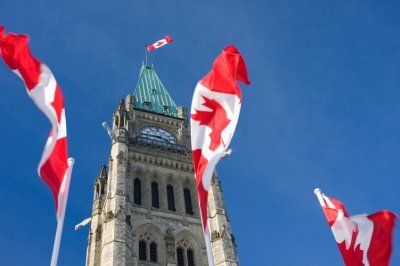 Accompanying family members, including spouses or common-law partners, as well as dependent children, may also come to Canada along with the principal applicant. In order to be in a position to receive an ITA in an Express Entry draw, individuals are first required to meet the eligibility criteria of one of the three immigration programs managed through the Express Entry system — the Federal Skilled Worker Class (FSWC), Federal Skilled Trades Class (FTSC), or Canadian Experience Class (CEC). Upon entering the pool, candidates are assigned a CRS score based on factors including civil status information, education, work experience, language ability, and other criteria. This score determines their ranking in the pool. During periodic draws, IRCC issues ITAs to the highest-ranking candidates. Those candidates who receive an ITA may submit an application for Canadian permanent resident status. Learn more about increasing CRS score and ranking.